The United States and Poland are kicking off an international conference on the Middle East on Wednesday amid uncertainty over its aims and questions about what it will deliver. Initially it was billed by President Donald Trump's administration as an Iran-focused meeting, but the organizers of the "Ministerial to Promote a Future of Peace and Security in the Middle East" significantly broadened its scope to include the Israeli-Palestinian conflict, the fight against the Daesh group, Syria and Yemen. The shift was designed in part to boost participation after some invitees balked at an Iran-centric event when many, particularly in Europe, are trying to save the 2015 Iran nuclear deal after last year's U.S. withdrawal and re-imposition of sanctions in its self-described "maximum pressure campaign." While Israeli Prime Minister Benjamin Netanyahu and U.S. Vice President Mike Pence will attend along with Secretary of State Mike Pompeo and his counterparts from numerous Arab nations, France and Germany are not sending cabinet-ranked officials, and E.U. foreign policy chief Federica Mogherini is staying away. Turkish media said Ankara will only send their ambassador to Poland. Iran, which is celebrating the 40th anniversary of its Islamic Revolution this week, has denounced the meeting as a "circus." "The conspiracy of major states like the U.S. will not affect our policies," Iranian President Hassan Rouhani was quoted by Russian state news agency TASS as saying. Russia reviewed the agenda of the conference and decided not to attend, the Foreign Ministry said in comments carried by Russian news agency Interfax. The U.S. is seeking "to impose unilateral geopolitical interests through initiatives presented as opinions of the entire international community," the ministry said. China is not participating, and the Palestinians, who have called for the meeting to be boycotted, also will be absent. "The U.S., in cooperation with the Polish government, is seeking to liquidate the Palestinian national project," PLO Secretary-General Saeb Erekat said in a letter to foreign diplomats serving at the Ramallah-based Palestinian Authority (PA) on Wednesday. The summit "aims to bypass the Arab peace initiative and give a chance to Israel to normalize relations with other countries in the region," he said. Erekat warned that the U.S. policy toward the Palestinian issue emboldens extremists in the region. "It is harming the prospects of security and stability in the Arab world and the rest of the world," he said. The PLO official stressed that the Palestinian leadership "refuses to participate in the conference or give legitimacy to it." The PA said it has not mandated anyone to talk on behalf of the Palestinians, calling on Arab states not to meet with Israeli Prime Minister Benjamin Netanyahu or any Israeli official during the summit. "We think we will make real progress," Pompeo said. "We think there'll be dozens of nations there seriously working towards a better, more stable Middle East, and I'm hoping by the time we leave on Thursday we'll have achieved that." He did not, however, offer any details about specific outcomes. Pompeo's co-host for the conference, Polish Foreign Minister Jacek Czaputowicz, also steered clear of describing potential results. And, he made note of differences between the United States and Europe over the Iran nuclear deal known as the Joint Comprehensive Plan of Action, or JCPOA, that also exist among Washington and Warsaw. "Poland is a part of the E.U., and hence we are of the opinion and we accept the policy of JCPOA," Czaputowicz told a joint news conference with Pompeo on the eve of the conference. "We consider this to be a valuable element on the international arena." In a joint opinion piece published Wednesday by CNN, Pompeo and Czaputowicz said they did not expect all participants to agree on policies or outcomes but called for an airing of unscripted and candid ideas. In fact, three of America's main European allies, Britain, France and Germany, have unveiled a new financial mechanism that the Trump administration believes may be designed to evade U.S. sanctions on Iran. British Foreign Secretary Jeremy Hunt is attending the Warsaw conference, but his main interest is in a side meeting on the conflict in Yemen, according to diplomats familiar with the planning. Since Pompeo first announced the conference as a vehicle to combat increasing Iranian assertiveness during a Mideast tour in January, he has steadily sought to widen the program's focus with limited success. Despite his efforts, Iran is still expected to be a major, if not the primary, topic of discussion, notably its nuclear ambitions, ballistic missile program, threats to Israel and support for Shiite rebels in Yemen and Bashar Assad's government in Syria. On his way to Warsaw, Netanyahu made clear he believed the conference is centered on Iran. "The focus is Iran," he told reporters. "Iran threatens us on the 40th anniversary of the revolution. They threatened to destroy Tel Aviv and Haifa, and I said that they would not succeed, but if they try then I repeat that this will be the last anniversary of the revolution that they celebrate, this regime." Such rhetoric has prompted criticism from Europe and elsewhere but also from Obama administration veterans who have vocally opposed Trump's attempts to wreck the nuclear deal, which was one of their signature foreign policy achievements. 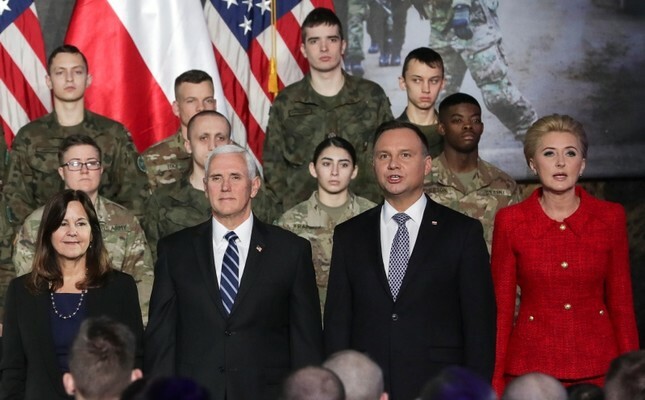 One group of former Obama officials, National Security Action, said the Warsaw conference was little more than an "anti-Iran pep rally" that underscored Trump's isolation. "We expect to see again this week an American approach to Iran that will showcase our alienation," it said in a statement. "More than merely embarrassing, the administration's stated 'maximum pressure' approach is incoherent, as America lacks allies willing to support such a strategy. Not a single E.U. country has endorsed pulling out of the Iran deal, unsurprising given that the Trump administration's own intelligence chiefs testified earlier this month that Iran remains in compliance." Around 60 delegations from around the world were expected to be received by Polish President Andrzej Duda at the Royal Castle in Warsaw for the two-day event.